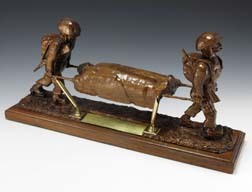 Woodcarving depicting two soldiers carrying a stretcher with a wounded man. The attached metal plaque reads, “Tired. Wounded. Proud… / Valor's the Word. Courage the Way / They are but Prices a Nation must pay -/For Freedom …. / Mayaguez Incident 5-1975 / By Buck Warren.” Two pen holders flank the plaque.